My hope that this can be the definitive source for information about the danger that 5G radiation will bring to the world as it continues to be rolled out in the future. I will be continually updating this resource as I learn more and as more information is released to the public. However, if you feel that there is anything significant missing from this article, please comment below so that I can look into it, and add it if needed. Although at the time of writing this, 5G is being tested in some markets, it is far from being fully released. Some telecom companies mention that they hope to have it available by sometime this year (2019). However, even if that is the case, it will likely be years later before it has the majority market share. The increased radiation danger will be a result of both the new technologies and the dramatic new landscape of infrastructure that 5G will require. We’ll get to all of this, but before we do, I wanted to provide you with the structure of this article. If you click on any of the links in the table of contents, it will jump you straight to that section. Why Is There A Need For 5G? The current portion of the radio frequency spectrum used by 1G, 2G, 3G, and 4G LTE (what we currently have) is crowded, and will not be able to support the sheer quantity of devices coming online every day. That means that 5G will utilize millimeter waves in the 30-300 gigahertz frequency, which hasn’t been used in the past. These higher frequencies have short wavelengths and are categorically more dangerous. The shorter wavelengths also do not travel as far, or as well through objects. This means that 5G will require hundreds of thousands of small cell towers to compensate. You’ll likely see small micro-cell towers on street signs, light poles, on the sides of buildings, on homes, and just about anywhere else the telecom companies can legally place them. So, not only will it be a much higher frequency, shorter wavelength form of electromagnetic radiation, it will also be in much closer proximity, increasing our exposure and the danger. Remember the inverse square law of physics. This law essentially states that as we double our distance from a source of EMF radiation, we quarter our exposure to it. This concept means that distance gives us exponential protection. With the current 4G LTE networks, we can simply use resources to locate cell towers and choose our homes accordingly. This will likely be near impossible in the future with the sheer proliferation of 5G cell towers. Alright, now let’s talk a little bit about what 5G really is, so we can better understand why it could be exponentially more dangerous than our current 3G and 4G wireless. So, if you’ve had a cellphone for quite a few years like I have, then you probably are familiar with the various generations of wireless technology. 5G, doesn’t stand for 5 Ghz, it stands for the 5th Generation of telecom wireless. 1G was the original generation and essentially just allowed for analog voice between callers. 2G, the second generation introduced in the 1990’s first allowed data to be sent in the form of simple text messages. 3G allowed for high-speed internet through faster data transfer. This gave us a connection to the internet and opened up a whole new world for smartphones. 4g expanded on this, allowing for significantly faster data transfer. This allowed us to watch Netflix practically in the middle of nowhere, and made it possible to scroll endlessly through social media. Now, we’ve all been using 4g LTE for about the last 10 years, and for the most part has worked quite well. However, with a growing network of smart devices and smartphones, this network is getting extremely crowded. The speeds that 4G support are also not keeping up with technologies demands. With Artificial Intelligence controlling more and more things, and autonomous vehicles hitting the roads, our current network isn’t cutting it. These types of devices not only require faster speeds and more bandwidth, but also significantly lower lag-tim, or latency. Which brings us to the advent of 5G, which has been researched and talked about for nearly a decade, but has only in the last few years been remotely a reality. Already being tested in several cities, 5G is closer than ever. Many phones are already out that will support it. So, now you understand a bit of why 5G came about, let’s dive a bit deeper into what exactly it is, and how it works. All generations of mobile networks have used similar cellular infrastructure. The service area that you are connected to is actually part of a digital geographical grid called a “cell.” Data is transferred from your device to a local cell tower in packets. This data is then transferred via a telephone network and the internet to wherever it was being sent. As you move around, these cell-towers are capable of handing you off without a disruption in your phone call, or the data that you are receiving. You’ve probably noticed the many cell towers in your area or your city. That is because these large cell towers are able to maintain connection to your device over long distances, and through many objects due to the wavelength of the frequency being used. The downside is that the 4g LTE network that these cell-towers currently support, is becoming outdated as new technology demands enter the market. 5G, or the fifth generation of wireless, will solve this speed issue. With data transfer rates of up to 10 Gigabytes per second, you will be able to download an HD movie in just a few seconds. This means that you will have internet that is 100-200 times faster than the current 4G networks support. Not only will the mobile network for 5G be much faster, but possibly more importantly, will have far lower latency, or lag-time. Imagine you are playing a game on your phone, and you tell it to make an action. Currently, this takes around 40-50 milliseconds to complete. 5G will allows latency as low as 5 milliseconds. Now, for games, this is not a big deal and we hardly notice it. However, take this and expand it into emerging technologies such as AI and autonomous driving. Lower latency means that vehicles can respond that much faster to new inputs of data, making them safer to drive. So, as far as speed, latency, and connectivity go, 5G will have some huge advantages, but will this be worth it? Don’t worry, later in the article we’ll get to some of the science and research behind why 5G radiation could potentially be so extremely harmful. In order to better understand some of this next part, take just a second and watch this quick video. It isn’t the most recent video, but does a really good job outlining some of the technologies that will allow a 5G network to exist and function. Don’t worry, I’ll break down the current (2019) updates on how 5G works after the video. Now that you have a little bit better idea of how all these technologies work together, let’s break it down so we can understand it a bit better. 5G will use what are called millimeter waves that fall in the higher frequency ranges of 30 to 300 GHz. The network your phone is currently connected to uses microwave bands between 700 MHz and 3 GHz. First of all, since the range of 30-300 GHz is essentially unused, carriers will have infinitely more bandwidth to provide users with. Not only that, but these shorter waves will allow for sending and receiving data to be transmitted on a single carrier wave simultaneously. One of the problems with these Millimeter waves, is that they are not nearly as good at penetrating things as our current cell towers are. So, the radiation from the radio waves gets blocked by simple things like trees and buildings. This means that instead of having large high-powered cell towers every half-mile or so, we’ll have thousands of smaller antennae on buildings, street signs, lamp posts, etc. Having these small cell towers nearby is a double-edged sword. Although they will allow the facilitation of these high network speeds, they will also be closing the gap on 5G radiation, putting it closer to our bodies than ever. These small millimeter wave antennae will also allow for something that you saw in the video, called massive MIMO (multiple-input multiple-output). This essentially means that instead of data passing back and forth on a single radio wave, data can be passed from a single device to multiple antenna at the same time. This allows for faster transfer of data. In order to keep this all straight, an algorithmic technique called Beamforming will be used. This essentially means that the best route for these data arrays will be calculated constantly, changing as your device moves around. This allows the thousands of small 5G antennae to know where to send the data at any given time. Now, as you’d imagine, the insane amount of new infrastructure that will be required will make this extremely expensive to install. So, most experts believe that it will only initially be available in larger cities, where carriers can actually see a return on their money. It will likely be some time before we see 5G in rural areas. Some pundits believe that it may never be financial viable to put 5G in very rural areas. So, if you are worried about 5G radiation like I am, that is one thing you could always consider, get just outside the city. Now, when it comes to the dangers of RF radiation that 5G will bring, there are two things we need to talk about. So, I want to break these down, and walk you through the studies for each one that show us just how dangerous this new technology will be. Let’s start by looking back at the studies showing how cell-phone, and cell-tower radiation harm the body. You’ve probably heard of a few of the big studies, and I won’t cover them all in this, but I wanted to give a general summary of some of the science and evidence showing that high-levels of exposure to RF radiation from cell-phones and cell-towers really can be harmful to your health. Interphone Study – This extensive study looked at over 5000 cases of Glioma and Meningioma to determine what level of cell-phone use was observed. Ultimately they found that those with the highest exposure to RF radiation from cell-phones did have an increased chance of developing brain tumors during their lifetimes. This study along with a mountain of other evidence was part of the reason that the World Health Organization classified RF radiation as a “possible carcinogen” in 2011, shortly after the study was published. “The Influence of Being Physically Near To A Cell Phone Transmission Mast On the Incidence of Cancer. – I know, it’s a long name, but it is an extremely important study showing how being physically close to cell-towers of any kind, can increase your risk of certain cancers. This is particularly important with the coming of 5G, as our proximity to these micro-cell towers will be much closer. The study, conducted in 2004 in Germany, looked at the case histories of 1,000 different patients between the years 1994 and 2004. They classified the participants into groups based on how close to cell-towers they lived. The study ultimately found that there was a significant correlation between how close people lived to these cell-towers and their risk of developing cancer. “The proportion of newly developing cancer cases was significantly higher among those patients who had lived during the past 10 years at a distance of up to 400 meters (1,300 feet) from the cellular transmitter site, which has been in operation since 1993, compared to those patients living further away, and that the patients fell ill on average eight years earlier. Ramazzini Study – Perhaps one of the most frightening studies actually came out quite recently. The well respected Ramazzini Institute out of Italy studied how frequent exposure to RF radiation at levels consistant with legal cell-tower radiation affected their lives. “The US NTP results combined now with the Ramazzini study, reinforce human studies from our team and others providing clear evidence that RF radiation causes acoustic neuroma (vestibular schwannoma) and gliomas, and should be classified carcinogenic to humans,” stated Lennart Hardell MD, PhD, physician-epidemiologist with the Department of Oncology, University Hospital, Örebro, Sweden, who has published extensively on environmental causes of cancer including Agent Orange, pesticides and cell phone radiofrequency radiation. I could go on and on about all of the studies and evidence linking RF radiation to negative health effects, but I think that should suffice for the purposes of this article. Instead, I want to spend some time talking specifically about how 5G Radiation has been shown to affect our health. Since it has not been released on a wide-scale, our exposure to it and ability to study it’s effects has been limited. However, there is still plenty to look at that should make you nervous. Alright, now it’s time to talk specifically about some of the ways that 5G radiation will specifically be harmful. To start with, I want to quote a bit of what Dr. Joel Moskowitz, a public health professor at the University of California told the Daily Mail about how 5G will be harmful. ‘The deployment of 5G, or fifth generation cellular technology, constitutes a massive experiment on the health of all species. Because MMWs are weaker than microwaves, they are predominantly absorbed by the skin, meaning their distribution is quite focused there. Since skin contains capillaries and nerve endings, MMW bio-effects may be transmitted through molecular mechanisms by the skin or through the nervous system. Dr. Moskowitz comments to the Daily Mail are a frightening warning about just some of the physical effects experts and scientists expect to see with the continued rollout of a 5G cellular network. Now I want to a really important letter. In 2016 a Physician named Dr. Yael Stein of the Hadassah Medical Center in Jerusalem wrote a letter opposing the implementation of 5G and the Millimeter Wave Technology it would utilize. He addressed the letter to the United States Federal Communication Commission, the U.S. Senate Committee on Health, Education, Labor and Pensions and the U.S. Senate Committee on Commerce, Science, and Transportation. I won’t include the entire letter in this article, but will include all of the groups conclusions, as they are extremely telling of the danger that 5G radiation will expose people to. Public exposure to millimeter waves, in the sub-Terahertz frequency range, is currently less common. If these devices fill the public space they will affect everyone, including the more susceptible members of the public: babies, pregnant women, the elderly, the sick and electro hypersensitive individuals. Potentially, if G5 WI FI is spread in the public domain we may expect more of the health effects currently seen with RF/ microwave frequencies including many more cases of hypersensitivity (EHS), as well as many new complaints of physical pain and a yet unknown variety of neurologic disturbances. It will be possible to show a causal relationship between G5 technology and these specific health effects. The affected individuals may be eligible for compensation. There is a host of research showing the potentially harmful effects of pulsed MMV’s, but I don’t want to bog this post down too much. However, the group over at saferemr.com put together a good compilation of research and letters related to 5G radiation that I would encourage you to check out when you have a chance. Or, if you’d like to read a large collection of letters sent by various doctors and scientists on the dangers of 5G radiation and cell towers, the Environmental Health Trust put together a great list. Along with the research, hundreds of letters have been sent by scientists, doctors, and researchers, to organizations around the world calling for a halt to the rollout of 5g. A group of over 250 scientists from around the world in 2017 wrote and published a declaration called the “5G Appeal” asking for a moratorium on the building of 5G infrastructure. This was a followup to a previous letter sent to the United Nations with a similar request. You can read the entire published appeal here. “This is a unique situation in the history of the human kind when the whole human population will be exposed to man-made devices emitting non-ionizing radiation that was insufficiently tested before deployment. What is and what will be the responsibility of the scientists, decision-makers and industry leaders who permit deployment of insufficiently tested technology that will affect us all? The answer is simple – no responsibility… because if any health problems will show up in the future, these will most likely take tens of years of time to manifest and, by then the persons that currently enable deployment of insufficiently tested radiation-emitting 5G technology will be retired or the proverbial ‘six feet under.’” -Dr. Darius Leszczynski, July 18th, 2018 in Assumption of Safety for 5G by Government Agencies, No Science. It should not come at all as a surprise to you that telecommunication companies, cell-phone manufacturers, or just the technology sector as a whole does not want you to know about just how powerful 5G will be. They don’t want you to fully understand that the radiation from 5G will likely be far beyond anything we can currently understand or comprehend. Just know, that this will likely be an information war between those companies and industries, and the parents, scientists, and researchers who feel that this will likely be a true danger. Recently, Verizon put up a new website called “Let’s 5G.” The entire purpose of the website is to advocate for the immediate rollout of 5G. The pictures, articles, and information, are only focused on the positives. It is marketed towards young people and encourages them to contact their state and local officials. They are also giving deceptively simple answers (in my opinion) to important questions. Take a look at the screenshot below, which is the entirety of their answer to the question, “How does 5G Work?” If you read the above section about how 5G actually works then you understand that this is overly simplified, and does not at all touch on the danger that these “small cell” antennas pose. Although what they mention in that answer is technically true, they leave an enormous amount of information out, and don’t highlight how having radio frequency radiation emitted from places like “utility poles and street lamps” is actually extremely harmful. 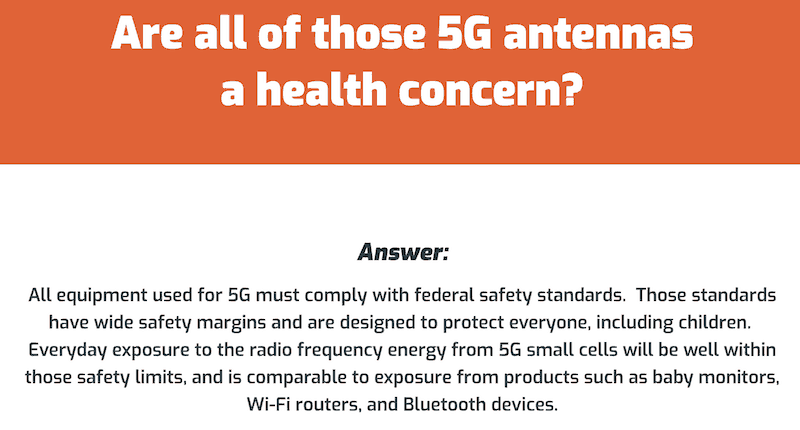 Going on, they answer the question “Are all of those 5G antennas a health concern?” Take a look below. Again, all technically true, but leaves out some of the most important information. They do not say that it is safe, just that it meets federal safety standards, which you’ve seen in this article are widely refuted by many experts. Just like SAR ratings, these federal safety standards are not immune to the pressure and lobbying of telecommunications companies and cell phone manufacturers. Not to mention that the federal safety standards they are mentioning has not been tested against a wide rollout of 5G since it has only began it’s testing phases in cities. What usually happens in these situations is that the technology is implemented far in advance of current safety standards, and then those standards are slowly updated as needed. Meanwhile the public at large is exposed to large, un-researched amounts of 5G radiation and millimeter waves the likes of which we have never seen. Hopefully, this helps you to understand the information war that will continue between those who stand to benefit from 5G implementation and those who feel it could be an extreme hazard. If you’re not convinced, watch some of the video below. Although it was released in 2016, it is very telling about the ways that federal regulators and companies try to spin information about the rollout of 5G. Alright now that we’ve spent so much talking about what 5G is, and why the radiation from 5G (or G5) is so dangerous, it’s time to talk about what to do about it. There are basically two things, first, advocate against it’s rollout. Second, find ways to reduce EMF radiation in your life, and prepare to protect yourself against the likely inevitable 5G rollout. We’re going to talk about both of these in depth. One of the most important things you can do, if you feel so inclined, is to do your part advocating against the rollout of 5G. It’s important to remember that although this technology is currently being tested, we have not yet reached a point where we can’t still stop it. Since building the infrastructure to support this new cellular network will be so prohibitively expensive, it is possible that the cost, combined with public outrage, could convince companies to rethink it entirely. It is also possible to get federal agencies involved in protecting their citizens. Or, at a minimum, delaying the rollout to further study the biological harm that the radiation from 5G networks will cause on human, plant, and animal populations. Don’t do anything you feel uncomfortable with, but if you feel inclined to speak out, the Parents for Safe Technology have put together a fantastic resource outlining a host of ways that you can speak out against 5G. It includes agency email addresses and phone numbers, as well as education and stock letters to help you. You can find all the information you need on their Take Action page. Alright, now it’s time to actually talk about what we can do to protect ourselves. Since 5G isn’t really here yet, we are going to talk mostly about the ways we can prepare. Some of those preparations include reducing our exposure to EMF radiation, including RF radiation, in our lives already. We know now that the danger of EMF radiation is cumulative, not acute. So the more radiation you are exposed to over a lifetime, the greater chances you have of being harmed by it. 5G will expose us to enormous amounts of RF radiation, so one of the best things we can do is lower our exposure in general. I’m going to outline some of the most important things you can do. After that I’ll point you to some quality resources for other ways you can protect yourself against EMF radiation. I don’t want to include all of that in this article since it isn’t specifically related to 5G, and this article is already getting extremely long. No matter who you are, or what you are doing, if you care at all about the danger of EMF radiation or 5G, then you need to get an EMF meter. Not only will a quality EMF meter allow you to measure the radiation exposure around you, but it will also tell you if the steps you are taking to protect yourself are actually working. For example, say that you have a smart meter on your home, and you want to shield yourself. You purchase a quality smart meter shield, but aren’t sure if it actually reduced the radiation in your home. Having a good EMF meter will tell you. There are endless ways that you can use an EMF meter to learn about the exposure risks in your home, in your neighborhood, or at work. You can tell not only how much radiation, but what kind you are being exposed to. A good EMF meter will also be your absolute best friend when it comes to measuring potential 5G implementations in your neighborhood. The trouble is that most EMF and RF meters on the market are designed to measure the current outputs of RF in the sub 8 Ghz range. When it comes to 5G, it is being tested in two ranges primarily. Below 6 Ghz, and between 30-300 Ghz. Currently there isn’t a publicly available meter that can measure in both of these ranges, so we have to go with the best that is available. 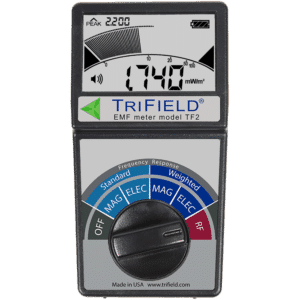 I typically recommend the Trifield TF2 because it is my absolute favorite EMF meter, and really easy to use. However, strictly speaking, it is not the best RF only meter on the market, so it isn’t the one I’m going to recommend for measuring against 5G radiation. So my recommendation for your fight against 5G has to be the Acoustimeter AM 10 that you can get on Amazon. 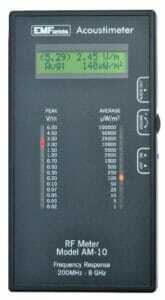 As far as EMF meters that are easily available, this is probably the best RF meter on the market. It can measure in the frequency ranges of 200 Mhz to 8 Ghz, which covers the entire lower range of 5G, which is being widely tested at the moment. This meter is also really easy to use, and a tool that you want to have with you all the time. It is chosen by many experts in the field, and one I use myself when strictly testing for RF radiation exposures such as smart meters. However, regardless of which EMF meter you choose, just be sure that it can measure RF radiation, and not just magnetic and electric like some of the less expensive meters. 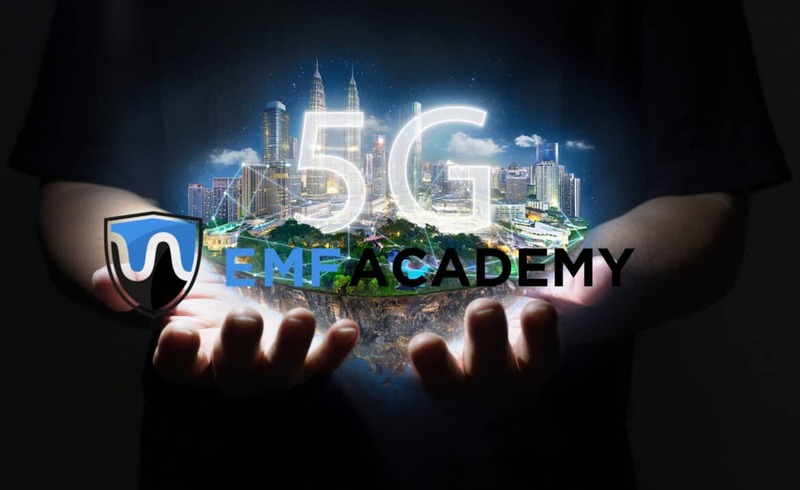 Remember that EMF radiation includes electric field, magnetic field, and radio frequency radiation and that when it comes to 5G, we are only concerned about the radio frequency radiation. If you want to learn more about EMF meters or find out which is best for you, you can checkout my full guide here. Alright, now that we’ve looked at perhaps the most important step, getting a good EMF meter, it’s time to look at other ways we can reduce EMF radiation in our lives. Doing this will help us prepare and combat 5G radiation by reducing our cumulative exposure. I had to list this because it is just so important. There are tons of great products on the market that I recommend, but probably none that will protect you more from the coming dangers of 5G than a quality cell phone case. Regardless of how powerful the new small cell towers will be, or how close they will be to us, or how powerful this new network will be, our cellphones and choices will be what amplifies the danger. Cellphones one of the most pervasive sources of EMF radiation in our lives because of their power and proximity to our bodies. A good cellphone case will protect your brain and body from the vast majority of this radiation. So, even if your phone is connected to 5G in the future, and is receiving and emitting more radiation, your brain will stay just as protected. Of course, doing things like using your cell-phone less, getting a pair of Airtube headphones, utilizing speakerphone and airplane mode are all important. However, as we become more connected every day, having a cellphone is almost a requirement. This is where having a quality case will be a must. 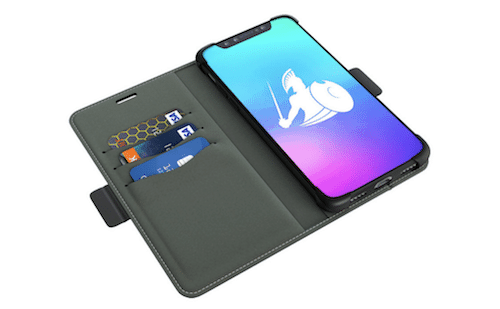 I’m personally using (and always recommend) this case from Defendershield. It is what my wife and I both have on our phones, and from a company I just really trust. However, there are other solid cases on the market, just be sure you do your research and get yours from a reputable brand. Like I talked about above, I don’t want to bog down this post too much with information I’ve already provided in more complete ways in other posts. So, I’ve taken some of my absolute best tips to reducing EMF radiation, and condensed them into a short, simple, actionable list for you. Each one comes with a link to where you can learn more about that particular topic. Turn your cell phone off at night. If you use your phone as your alarm clock, be sure to put it in airplane mode to limit the amount of radiation it produces. (read more about cell phone radiation). When using your cell phone, put it on speaker phone or use a pair of headphones. Even better, use a pair of airtube headphones (read more about this here). Whenever possible, use an ethernet cable to your laptop or desktop computer instead of WiFi. Don’t keep your cell phone in your pocket, the radiation in close proximity to your body can cause some very unwanted health effects. Have a baby in the home? Consider using a wired baby monitor instead of the popular wireless versions or video monitors. Whenever possible, replace wireless with wired. From phones and tablets, to computers, wired is almost always going to be a reduction in radiation. Ugh, where do I begin. When I set out to research and write this article, I thought I understood how dangerous this new network and technology would be, but honestly, I had only scratched the surface. The scope of this network, and the infrastructure it will require, is like nothing we have ever seen. It will eventually impact the majority of the population, and will probably be part of our everyday lives far before anyone really knows if it is safe at all. There are good organizations fighting against the rollout, and if you have it in you, I’d encourage you to look for ways you can join them. Continue researching, learning, and finding ways you can protect yourself and your family. A last request. If you found this article at all helpful or informative, would you do me a favor and share it in some way? Whether it is on Facebook, or Pinterest, or Linkedin, or linked on your own website, or even an email to a friend. One of the best things you can do is to share quality information with other people. If you did share it, shoot me an email so I can thank you. Or, if you just have a question or need some help, email me. I’ll do my absolute best to get back to you and help. Great info! Thank you! If you can, please address how apartment dwellers can further protect themselves when they aren’t able to move or relocate. Great article. Loved the research you shared. Thank you for the tips. We just went to hardwire in our home. No cell or EMF stuff in bedroom. Have Salt lamps in every room. Our smart meeter has a homemade faraday cage over the outside and a aluminum double-screen on the inside in the garage. Neighbors on each side of us have smart meters that face away from us. Don’t use the microwave. Will be getting an EMF-RA meeter and continuing to implement other options.